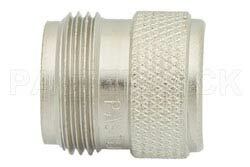 RF coaxial connector cap (can also be referred to as a RF connector dust cap in some cases) PE6116 from Pasternack is a non-shorting design. This non-shorting RF connector cap has a N connector series and a female gender. Our N female non-shorting connector cap is manufactured with a brass body material and nickel body plating. Coaxial non-shorting N connector / protective dust cap PE6116 from Pasternack has no chain and is just one part of over 40,000 components for RF, microwave and millimeter wave applications supplied by Pasternack. 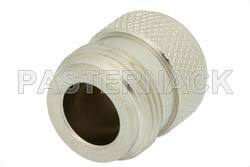 Our N connector dust cap in non-shorting design is in-stock and Pasternack is where to buy your RF connector dust caps for same day shipping in the United States or internationally, as with all other Pasternack RF parts.